If you want to set up dual monitors but you need a bit of guidance first, this article will give you the information you need to set your system up to use dual monitors. First of all you'll need your extra monitor. So my first tip is that you don't need to shell out a fortune for a top end super snazzy new one. A second hand monitor will be perfectly adequate for looking at spreadsheets and viewing websites as a secondary monitor. It might have a couple of dead pixels and the odd scuff mark but that isn't going to effect your productivity. You can get really cheap second hand monitors on Gumtree from as little as £15. They should usually come with their connecting cable and a power lead. Ask if you can see it working before you go to pick it up. Now you have your monitor, how do you connect it up? You'll be working either on a laptop or desktop computer, I'll deal with each of them in turn. And your monitor will also have one, or more, of these types of connections. If it has more it is to give you the choice of connection, you don't need to connect both. But what if the output of my laptop doesn't match the input of my second monitor? Don't worry! You can get adaptors for all the different types. 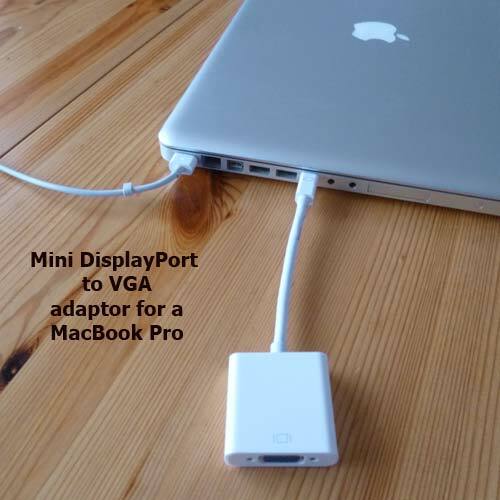 Just google, for example, "displayport to DVI cable" or "displayport to DVI adaptor" and you will be able to get an cable or adaptor for between £5 & £30. 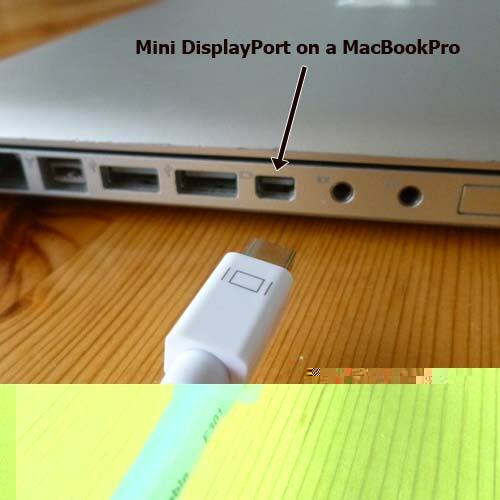 You can then connect your monitor to your laptop, and you should see some output on your second screen. You might then need to configure your software so that your screens are aligned and your mouse cursor travels seamlessly from one monitor to the other. I'll deal with that at the end of the article as it is the same for both desktops and laptops. 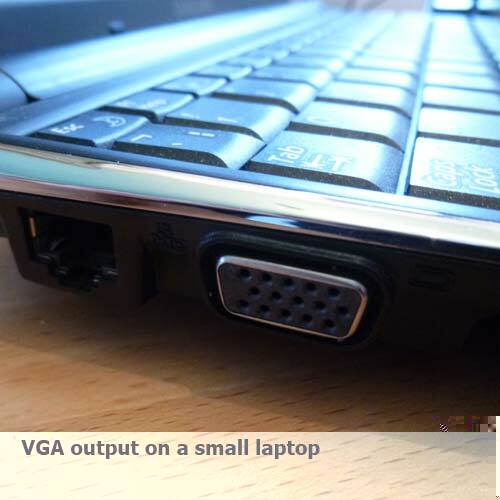 This image to the right shows the back of a recently purchased desktop that allows you to connect two monitors straight away (and you have a choice of four output types: DisplayPort, HDMI, DVI and VGA). This is because the hardware on the motherboard has been set up for dual monitors. Older machines may have a selection of video outputs but they may be just there to give you a choice of connection type rather than for dual displays. Try connecting two monitors and see if you get any response. You may all ready have a graphics card in your machine that can handle dual monitors, that will have outputs like the card shown below, try your monitors on those outputs. If you can't get dual displays from the connections you already have you will need to purchase a graphics card that has multiple outputs. You can get your graphics card from companies like CCL in Bradford or on the internet. A lot of the cards you will see will have cooling fans and are designed for high end graphics and gaming and can cost 100's of pounds. But there is no need to shell out so much; if you are simply using it for a 2nd monitor for viewing spreadsheets and the like you can get a perfectly adequate card for £20, which is how much I paid for the card pictured below. 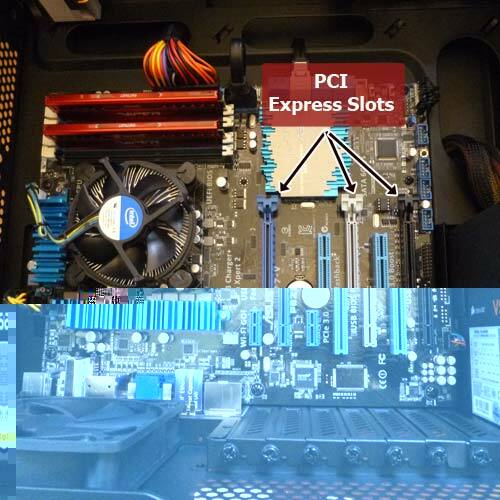 If your computer is less than 4 years old it almost certainly has PCI Express slots where you can slot in your new card. If it is older you may need to check your machine and do a little research: google PCI, PCI express and AGP and find out what sort of slots your computer's motherboard has, you will have to open it up and have a look inside. Remember when opening up the back of your computer turn it off first! And when handling your graphics card or touching anything inside your computer to earth yourself first. You can do this by touching a radiator. Static electricity can damage components. You can't use the video output from your motherboard and the graphics card at the same time. It's one or the other. So to set up the dual monitors both your connections will need to come from the new graphics card. Once you have your new graphics card you will need to put it into your machine. This video show you how to insert a graphics card and set it up to work with dual monitors. Once the graphics card is in and connected you can fire up your computer and set up the monitors. You will probably have to play around with the display settings on your machine. Click on the 2nd monitor and make sure the "Extend the desktop onto this monitor" is selected. You can then click on the monitor icons and move them around to match your set-up. Hope that helps. If you have any problems remember Google is your friend and so is YouTube. There is lots of helpful stuff out there, half the problem is knowing the correct terms to search for, now at least you have an idea. I have amd radeon hd 7770 and i have just baught a new monitor(cheap 95euros) It only has vga port but on my desktop i have 3 ports: hdmi (already connected), dvi and display port. 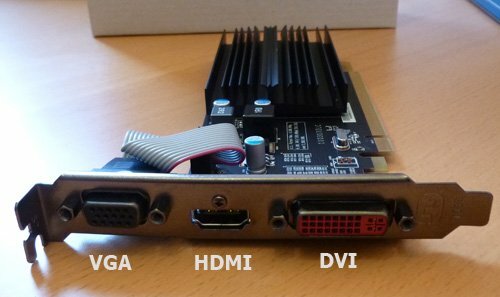 I used dvi to vga converter but when i plugged it in both monitor said '' no signal ''can you help me? Hi Jošt, 5 months later, but I hope you managed to get sorted? I recently splashed out on a gaming desktop. It has NVIDIA GeForce GTX 970 4GB which supports both HDMI and DisplayPort and I also picked up a monitor that does the same. Can I use dual screen with my Optoma HD200X full HD projector (HDMI) and the aforementioned monitor? Well, multitasking has ruined me and so I would like to, say Netflix whilst playing a game. I don't have a TV. OK, well the honest answer is: I don't know. If you are using one output for the monitor and one for the projector I would guess that that should work.